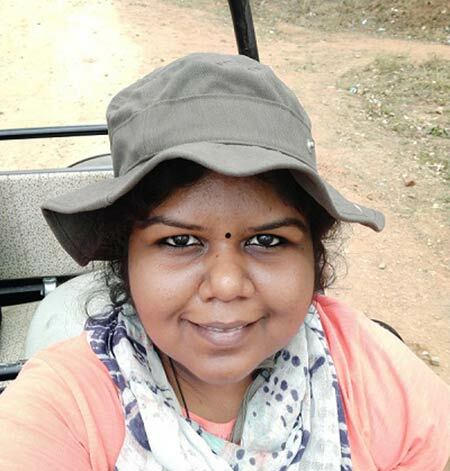 Chittra M, is a former software engineer on a career break – she now travels and writes, like there’s no coming back home. What gives her a high is anything to do with architecture, history, heritage, wildlife, nature, national parks, photography, food and coffee. Loves to explore rustic country roads, and once in a while gets her passport stamped. Her mantra has always been “work hard and travel harder”. She’s passionate about natural habitats and can get ready for a wildlife safari within two minutes – her travel gear is always in a state of readiness. She is a natural story teller and writes about her experiences and stories on her blog, MasalaBox. We now share sound bytes from our conversations with Chittra M.
Q. These days, holiday resorts are strategically located near sanctuaries. Does this make things convenient for travelers? How useful is this to widen the vacation experience? Having a good resort near a sanctuary works out well in many ways. Because these resorts have their own panel of naturalists, who have years of experience and are excellent guides. It’s an opportunity to share magical moments with someone who understands the language of the jungle, even in the middle of the night. National parks are not all about spotting the big cat - many resorts are now coming up with cycling tracks through buffer zones, tribal village trips, nature walks, star gazing, bush dinners, and sundowner sessions - experiences closer to nature. You can learn about flora and fauna, insects and birds - and you can learn about sustainable living. Especially in terms of how they process organic waste, and manage organic vegetable gardens. Importantly, it’s learning about being plastic-free and environment friendly. There are so many takeaways that you will experience, that one visit out here is not enough. Q. What is it really like to go on a wild life safari? Are you scared, uneasy - just waiting get back to base camp? The thrill of driving into the unknown is unexplainable. You never know what the next turn, or the next fork in the road can lead you to. It is like sitting at the edge of your seat as your vehicle moves slowly through carefully planned routes. 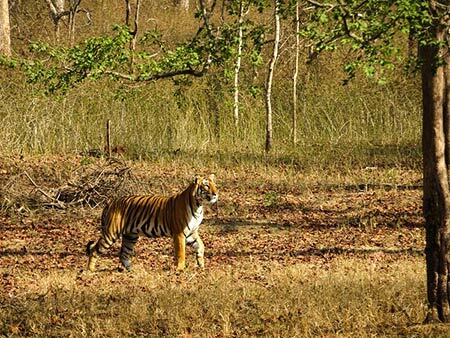 Even though forest guides are fairly accurate at predicting tiger trails based on previous sightings, you’re always waiting for the unexpected to happen. However, what makes me jump out of my seat is a predator suddenly springing out of nowhere – taking you by total surprise. Things are so unpredictable inside the jungle. When I see the big cat up close, it is nothing short of a heart thumping, hair raising experience – with a tingling sensation at the nape of your neck. And that’s a page turner for me in the forest. You want to stay, you want to run, you want be safe, and you want that moment to freeze till you’ve had enough of it. Q. Can you describe your sanctuary visit at the Bandhavgarh National Park? The Bandhavgarh National Park is a relatively smaller park but dense, with a visible population of tigers - so there is a high chance to be rewarded. This park will always remain my top-of-the-list favorite, because I got to see a tiger, really up close. I remember once, we were lucky to spot pug marks and were told that these were of an adult tiger – she must have led her cubs to a thicket nearby. Our (AHA!) moment happened when our forest guides heard a shrill call of the deer – that was their cue to steer the vehicle in the right direction. And sure enough, we spotted the predator - there she was getting closer and closer - that majestic walk, gentle yet menacing. I could feel a lump in my throat and went numb all over. Never have I seen a tiger before within growling distance. I was awestruck by her beauty, and her sheer size made me feel really small in comparison. Bandhavgarh also has other places of interest like Sheshaiya, a huge reclining Vishnu statue with Brahma and Shiva on either side – you will find this right in the middle of the jungle. The Bandhavgarh Fort currently restricts entry to the public as any increase in the number of visitors disturbs wildlife. But you can still go right up to the monolithic statue and feel that sense of awe at something that’s larger than life. Q. 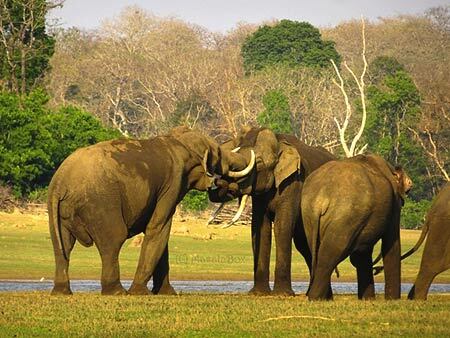 Can you describe your sanctuary visit at the Satpura National Park? If other national parks are known for predator sighting, Satpura is a study in life inside the forest and what really happens within, from dawn to dusk. It is a forest that is inclusive to animals and bird life, with a natural landscape that is unique and rugged. You come across hilly and rocky sections, interspersed by plains. It is not that Satpura is devoid in terms of predator population, but these are fewer in number. It is one park where you should go with an open mind to enjoy the sights of the forest rather than looking for predators - which means you still get to see boar, sambar, sloth bears – quite often with their family units. On one trip I managed to see wild boar with little shoats in tow. I also saw a sloth bear carrying its cub piggyback. The park also has a guest house run by MPTDC – right in the middle of the jungle. Satpura is also the only park where a “walking safari” is an useful option – which is just right during the winter season. Another visual treat is the Denwa river which flows right through the forest. Even in summer, one can see streams flowing through the park – quite like an off-roading experience through the park. Q. Do you have tips / words of advice for people visiting a sanctuary, is there a rule book? Before you go on a safari, your guide will brief you on what you can do, and what you can’t – but it’s up to each one of us, to behave in a responsible manner. You don’t really need a set of rules to be considerate, thoughtful, and a friend of the forest.